Today (Tuesday): Sunny. Highs around 40. 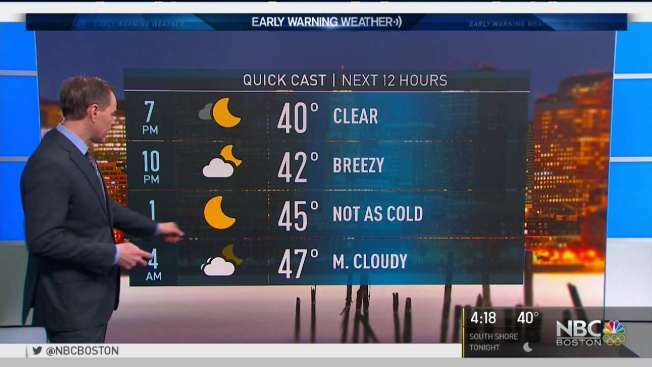 Overnight Tuesday Night: Mostly clear, temperatures hold steady then rise through the 40s. Wednesday: Sun and clouds, chance sprinkle. 50s briefly at midday. A high-pressure dome is cresting directly over New England today, and while that resulted in a downright cold night for one and all, sunshine dominates for nearly all of us today. As the center of high pressure ridges move on, warmer air is able to stream in behind them – sometimes that happens during the day, but this time, warmer air arrives at night. As a result, the overnight wind will increase from the southwest and after only a few hours of temperatures barely falling this evening, temperatures will actually rise during the overnight. The combination of new, warm air and some sunshine will bump Southern New England into the 50s Wednesday ahead of a fast-moving cold front that will already cross Northern New England by morning, meaning northern residents won’t break out of the 40s with a few rain and mountain snow showers. Nonetheless, nearly all of us will be milder than normal, with a sprinkle and a wind shift marking a return of cooler air for Southern New England by afternoon. As has been the case, cool air is dry air, so Wednesday night through Thursday will be dry until the next energetic disturbance drives rain and North Country snow showers in from the west overnight Thursday into Friday morning. Expect a dry start to the weekend Friday afternoon through Saturday, while Sunday remains a day we’re watching: more clouds for sure, but a close call on whether rain develops over the region. The chance of showers rises again by midweek next week in the exclusive Early Warning Weather 10-day.